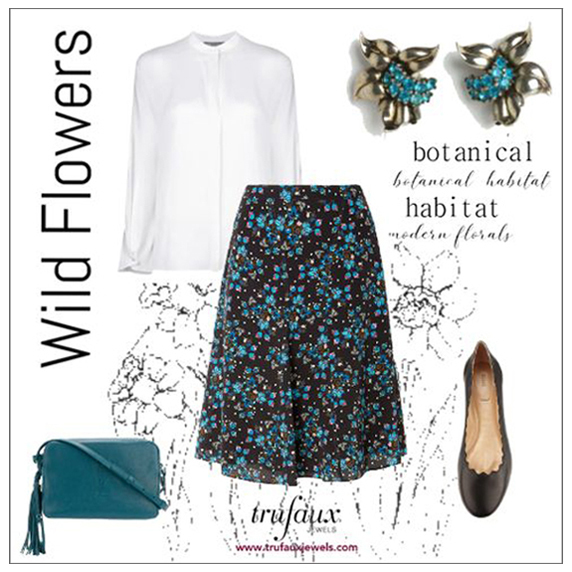 If it’s spring, it’s time to bring out your flowers – in your garden and your wardrobe. A perennial fashion favorite for decades, floral prints were again in bloom on the runways for Spring/Summer 2019. According to British Vogue, “there’s a floral for everyone”. And that includes jewelry. 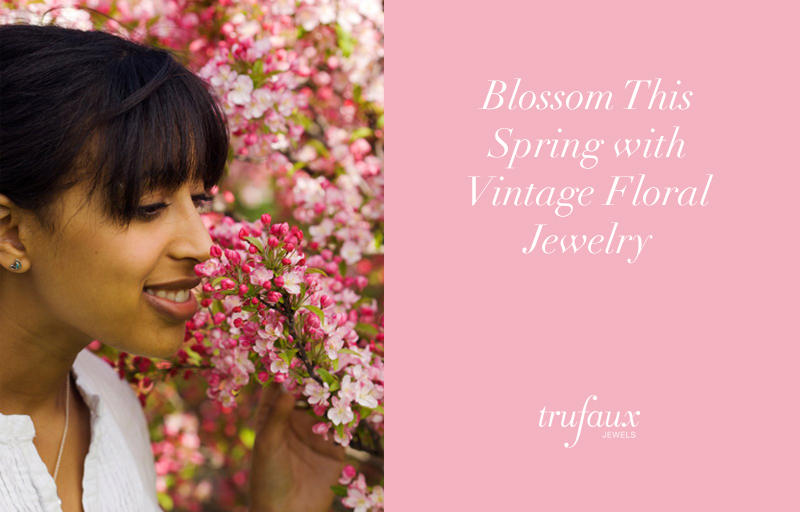 This month’s styling tips focus on vintage floral jewelry. 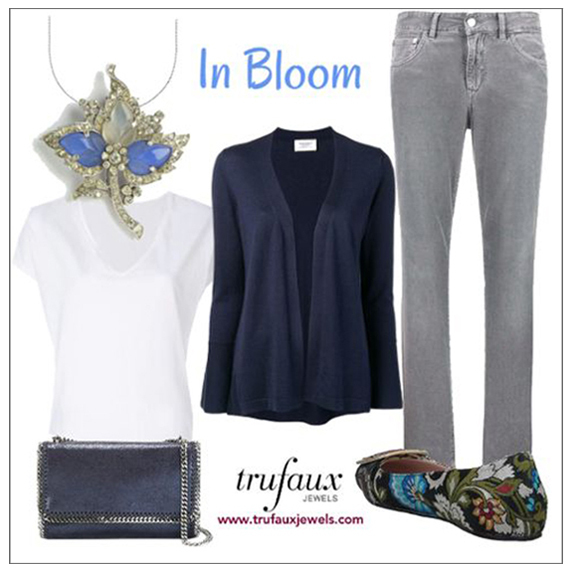 I hope these ensembles inspire you to add blossoms to your everyday wardrobe. These two outfits from cool color palettes feature the same jewel – a Sterling Flower 1930s Necklace by Fahrner. Though simple in design with its filigree-topped flower petals and decorative chain, this piece is a fine example of the high-quality of this German maker. I’ve styled this versatile piece two ways. 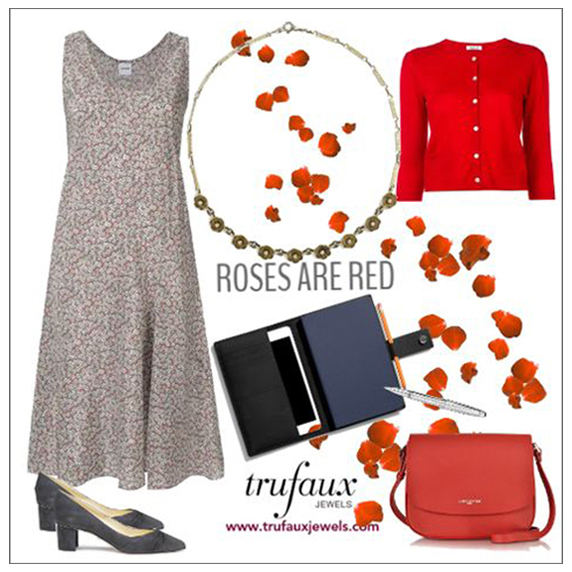 In Roses Are Red, it’s office-ready with a red-and-grey, round-necked floral print silk dress. I’ve paired it with a red cardigan, but you could also wear a blazer. 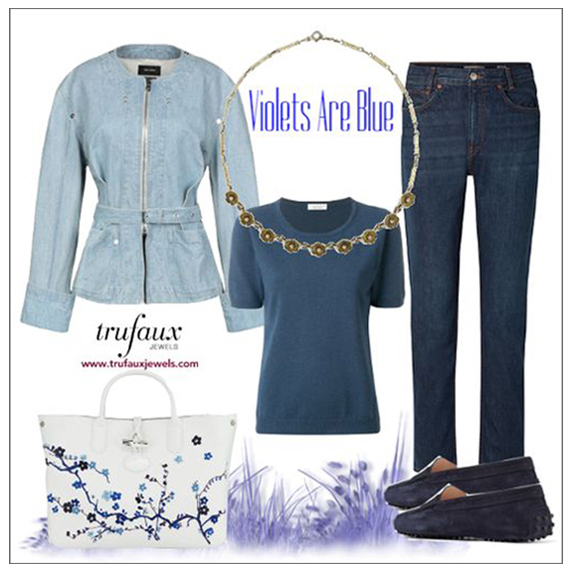 Violets Are Blue shows the necklace as an embellishment to a smart-casual ensemble of jeans, tee shirt, and denim jacket. The floral motif is repeated in the bag. 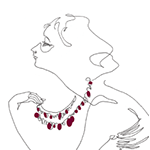 These ensembles show brooches worn as necklaces. The Aquamarine, Ruby, Diamanté & Vermeil Sterling Flower in Blossoms has a loop on the back that allows it to be worn as a pendant. I’ve shown it on a gold chain with a round-necked flowered blouse, jeans, and a linen jacket, in warm colors. 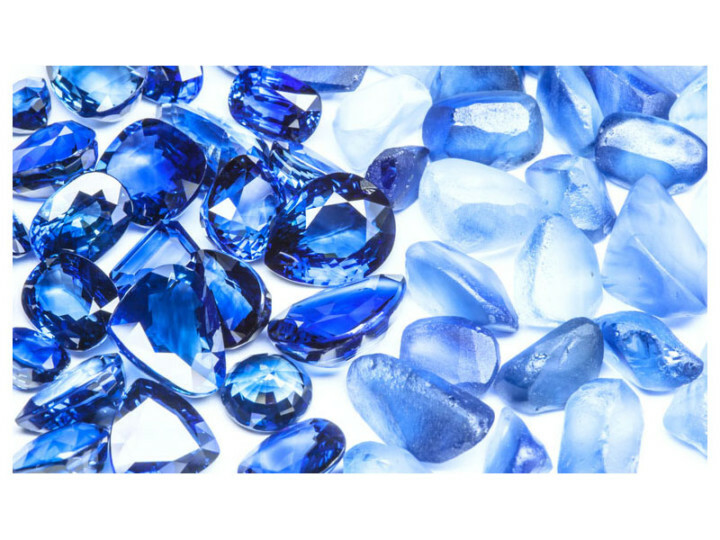 The jewel could also be worn as a brooch on the blazer shoulder. In Bloom on the right features this Chalcedony & Moonstone Fruit Salad Dress Clip on a silver chain. It is worn in the V-neck of a white tee-shirt paired with grey jeans and a navy cardigan. The shoes have a flower motif in a melange of hues. This outfit is for women who look best in cool colors. Whenever your sleeves leave your wrists bare, consider wearing a bracelet. 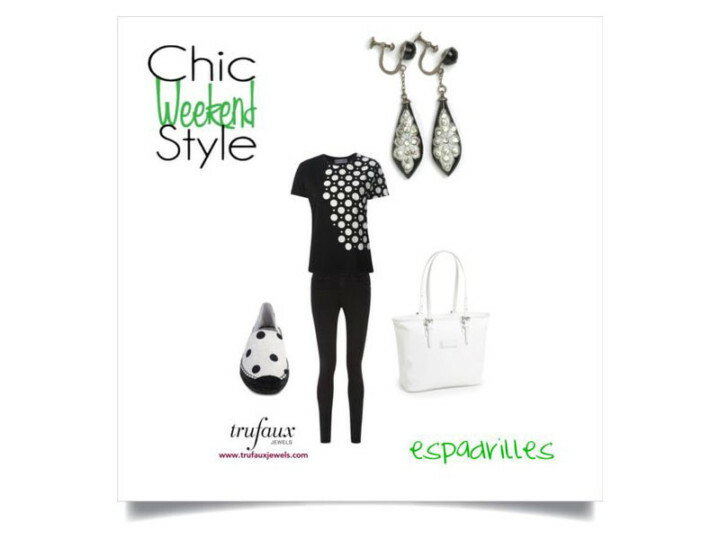 Because both of these outfits are smart-casual in style, you can go with bigger, more elaborate jewels than you`d wear to the office. The sleeves on the draped cardigan in Greenery are long, but you can push them back to reveal this Turquoise Glass Bead & Diamanté 1950s Bracelet. This fun piece has molded-glass leaves and diamanté woven onto a gold-tone mesh cuff. I think the color is a beautiful compliment to the khaki-green jeans and sweater – all from warm color palettes. Vintage Florals shows black-and-white floral-patterned jeans with a short-sleeved tee and sweater in cool colors. They`re the perfect backdrop for this Sterling Floral Link 1940s Bracelet. The textured surfaces of the flowers and leaves are raised from the back (a technique called repoussé). 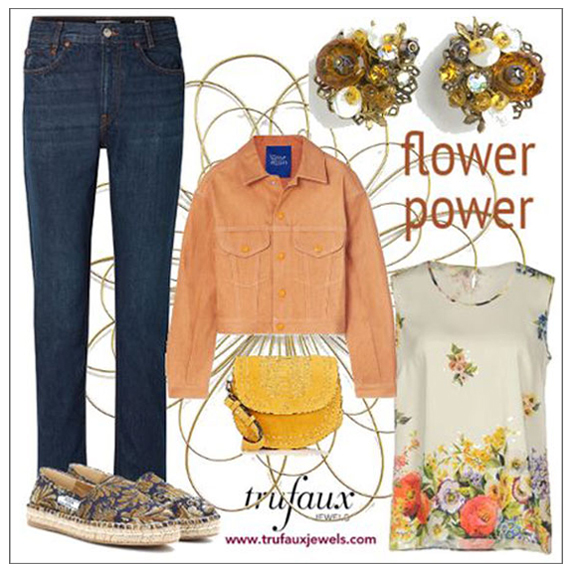 Flower Power, on the left, shows the floral motif in the espadrilles, top, and earrings. These Citrine, Golden Topaz & Mother of Pearl 1950s Earrings have layers of beads, stones, and metal leaves woven onto a mesh back. 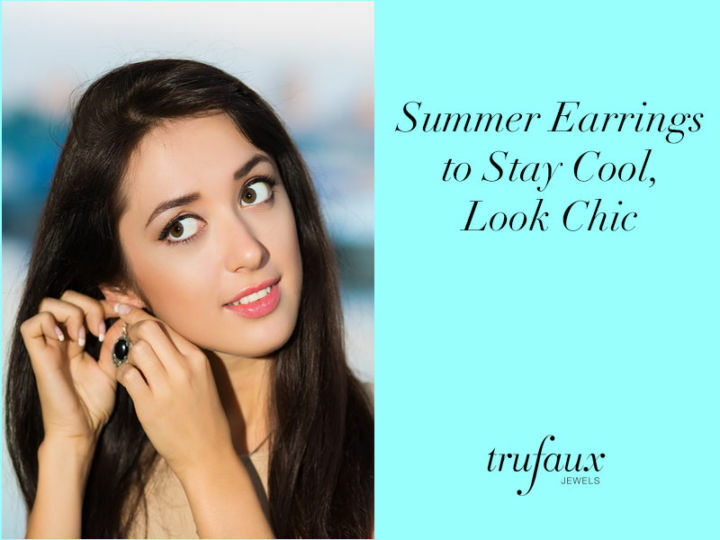 Well-made and unusual, these colorful ear clips are a fun addition to this outfit in warm hues. On the right, Wild Flowers is a more subdued look in cool colors with a floral skirt, white blouse, and these Aquamarine & Vermeil Sterling Flower Petal Ear Clips by Pennino Brothers. The term vermeil refers to gold-plating, which was used extensively in the 1940s. Visit the Spring Florals collection to see these and other bracelets, necklaces, earrings, and brooches that will bring your spring/summer wardrobe into bloom. Such pretty looks for spring!